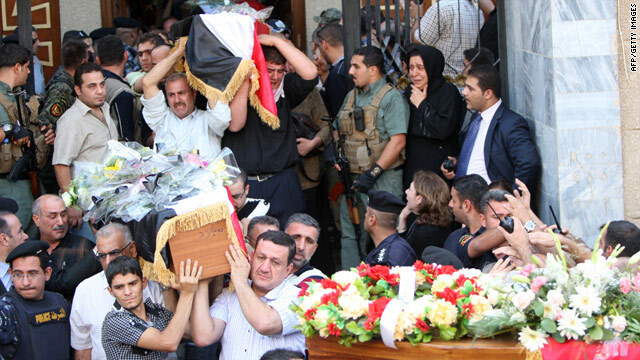 Iraqi Christians bury victims Tuesday of a church attack on October 31, for which the Islamic State of Iraq claimed responsibility. Baghdad, Iraq (CNN) -- All Christians in the Middle East are now "legitimate targets," al Qaeda in Iraq announced Wednesday, as the group's deadline for Egypt's Coptic church to release alleged Muslim female prisoners expired. An audio message released Monday gave the church 48 hours to disclose the status of Muslim women it said are imprisoned in Coptic churches in Egypt. The message purportedly came from the Islamic State of Iraq, which claimed responsibility for an attack on a Baghdad church Sunday that killed 58 people and wounded 75. The umbrella group includes a number of Sunni extremist organizations and has ties to al Qaeda in Iraq. The group said the women's alleged plight was the reason it stormed the church. Wednesday, the group released a new message saying, "The Ministry of War of Islamic State of Iraq declares that all the centers, organizations and bodies of Christian leaders and followers have become legitimate targets by the Mujahedeens, wherever our hands will reach them." Shortly after the message was released, Egyptian police sources confirmed that security has been reinforced at churches around the country. Additional protection was also being provided to the head of the Coptic Church, Pope Shenouda III, who is scheduled to give a sermon in Cairo in the evening, according to a police spokesman who could not be named in line with policy. Copts are adherents of an Egyptian sect of Christianity. About nine percent of Egyptians are Coptic, according to the Central Intelligence Agency World Factbook; 90 percent of Egyptians are Muslim. "This is a matter of extreme seriousness and we should not underestimate the threat," said Yusif Sidhom, editor-in-chief of Watani, a weekly Coptic newspaper published in Cairo. "We have to keep our eyes wide open and take all measures to ensure that our buildings and churches are not infiltrated." Sidhom said he was encouraged by the security measures taken by the Egyptian government, as well as by the position taken by political forces in Egypt, including the Muslim Brotherhood, which has condemned the attack on the church in Baghdad and condemned threats against Egyptian Copts. Worshippers at the Sayidat al-Nejat church in Baghdad were about to begin Sunday night services when gunmen entered the church, according to Martin Chulov, a journalist for Britain's Guardian newspaper, who was at the scene. As many as 120 people were taken hostage, said Lt. Col. Eric Bloom, a U.S. military spokesman. The gunmen held them for hours before security forces stormed in to end the standoff, arresting eight suspects. Most of the hostages were killed or wounded when the attackers set off explosives inside the church, Iraqi Defense Minister Abdul Qader Obeidi said. At least two of the attackers were wearing explosive vests, which they detonated just minutes before security forces raided the church, police officials said. "The sword of slaughter will not be lifted off the necks of their followers until they denounce what the dog of the Egyptian church has committed, and until they show the Mujahedeens their serious endeavor to pressure the combatant (Coptic) church for the release of our Muslim sisters, who are captive in the prisons of their monateries," the militant group said Wednesday. The group's claim that the Coptic Church in Egypt is holding female prisoners is based on widespread rumors of Coptic women in Egypt converting to Islam and being detained by the church in an attempt to compel or persuade them to return to their original faith. Both the Egyptian Interior Ministry and the representatives of the Coptic Church in Cairo declined to comment on the matter. As for Iraqi Christians, the chairman of the U.S. Commission on International Religious Freedom, said Wednesday they face "a grave terrorist threat." Leonard Leo said Christians are among the country's "smallest religious minorities," which face a "pattern of official discrimination, marginalization and neglect." USCIRF, an independent, bipartisan U.S. federal government commission, reviews violations of religious freedom internationally and makes policy recommendations to the administration and Congress. "It also is time for the Obama administration to acknowledge the sectarian aspects of the conflict in Iraq, which are evident in this attack, and ensure that U.S.-Iraq policy prioritizes the plight of the country's vulnerable religious minority communities," Leo said. "Congress already has taken this step, as reflected in House and Senate resolutions that call on the U.S. government to, among other measures, work with the Iraqi government to enhance security at places of worship and ensure that members of ethnic and religious minority communities do not suffer discrimination and can effectively convey their concerns to government. The administration should act accordingly as quickly as possible." CNN's Saad Abedine in Abu Dhabi, United Arab Emirates, and Ben Wedeman in Cairo, Egypt, contributed to this report.